Snail Shell Helms, or Snelms as they've been called, have become a new line of fashion in RuneScape. Members can kill Blamish Snails found in the Mort Myre Swamp, and make stylish helmets out of them. They offer both solid protection, and a new trend of fashion, but you'll need to have already done the Priest in Peril Quest before venturing into the land of Morytania. Blamish Snails can be found around the swampy areas of Mort Myre. After killing one, you'll be able to pick up both a Cookable meat and a Blamish Shell, which you can use a Chisel with to make it into a wearable Snelm. Chiseling a Snelm requires level 15 Crafting, and will give you 32.5 Crafting experience. There are 5 kinds of Blamish Snails that you can kill, each dropping a different colored shell. Three kinds of shells can be picked up from the snails southeast of the bank in Canifis, but in order to get the Blamish Myre and Blamish Ochre shells, you'll need to have also started the Nature Spirit Quest so that you can go inside the Mort Myre Swamp. Bark Southeast of the Canifis Bank; throughout the Mort Myre Swamp. 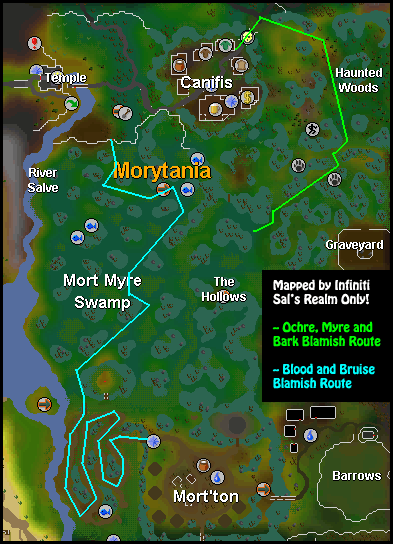 Blood Southeast of the Canifis Bank; throughout the Mort Myre Swamp. Bruise Southeast of the Canifis Bank; throughout the Mort Myre Swamp. Myre Throughout the Mort Myre Swamp. Ochre Throughout the Mort Myre Swamp. There are both rounded and pointed shells that you can get, depending on whether you kill a snail with a pointed or round shell. Blamish Shells are Members-Only and cannot be traded to the Free-Play world. Once you have obtained a Blamish Shell that you want to make into a wearable Snelm, just use a chisel with it. Now you can wear your stylish and protective Snelm anywhere you go!